Saturday, the 10th of September, was a beautiful late summer day at the Louise Moore County Park. The early birds heard Jim practicing his flute. Forty-one members of the Harvey Wolfe family were joined by six members of the Alfred Wolfe family plus a long-time friend and his friend. Name tags were provided for all. It was great to be reacquainted with Charles Wolfe, 90 years young, and the second youngest son of Alfred Wolfe. There were two present who shared the youngest category. Audrey Wagaman, 2 ½ years old, daughter of Cindy (Lew), and Ricky Wolfe, 2 ½ son of Alan (Richard). The couple traveling the furthest was Ralph and Millie Wolfe. Ralph is the youngest son of Harvey Wolfe. Uncle Charles provided humor for the gathering. Thanks to Betsy and Don for bringing Charles and his wife. It was good to have Terry and his wife, Roseanne join us this year. Terry is the son fo Marion Wolfe Smith, daughter of Alfred Wolfe. LEWIS: Cindy and Dave were celebrating their wedding anniversary (10). Andy wore his grandpa’s hat (Lew) to the reunion. Eleanor and Louann were present, Louann is pending some time with her mother during her convalescence from surgery plus grieving in the loss of Lew. Jennifer was tubing down the river while Dr. tim and cindy await the birth of their first child. Linda Smith Garcia and her husband, Jim, are relocated to Washington, D.C., and are back in their home in Waldorf, Maryland. Jim was the roving photographer and captured some interesting shots of all the activities. Greg (Virginia’s grandson) is a architecture student at Philadelphia College of Textile and Science. HENRY: Hank and Betty were traveling from West Virginia to Vermont and were unable to attend the reunion. Greg Wolfe, Hank’s son, and Phyllis, along with Sarah and Caroline, Greg’s daughters, were involved with genealogy and re-acquaintances. Greg has a computer software program with the Wolfe data plugged in. Sarah is a student at Swarthmore college; Caroline is a Junior at the Cathedral School. LEO: Francis Wolfe and Betty arrived early afternoon after a neighborhood yard sale. Francis was in the 2ne wave of soldiers landing on Omaha Beach on D-day. His name is inscribed on the wall of Liberty on Normandy Beach. June 6, 1994, the 50th anniversary of this event, saw a gathering of the Francis Wolfe family with four children, spouses, and nine grandchildren . . . what a great way to honor this husband, father, and grandfather. Brenda Wolfe Phillips gave birth to Melissa Aspen Phillips on December 28, 1993. Brenda was inducted into the Delaware Valley College Hall of Fame. While in college she was a four letter winner in basketball and field hockey, and the first woman to get the scholar athlete award at DelVal. Charles and Nancy are on an extended motor trip across country, ending in Florida for the holidays. Nancy’s father, Leonard Wolfe, son of Frederick Wolfe, and grandson of Alfred Wolfe, died during the past year. Betty and Leo celebrated their wedding anniversary. We’ll catch you next year. STANLEY: Betty Wolfe Jenkins has returned to the workforce, although she and Harry were looking at the Elderhostel offerings. Bill and Sandy don’t expect to experience another severe winter in the north and are planning to relocate in South Carolina. RAYMOND: While we were slipping and sliding last winter, Gerald and Joyce were in Moscow and St. Petersburg, Russia. He took a choir that he directs and they performed in that country. They also will be moving into a home overlooking the lake. SALOME: Salome has been going through major apartment renovations, all for the better, thanks to a new landlady. Stop and see. HAROLD: Sandra arrived late afternoon. She started a new job and Saturday was a workday for her. RALPH: Ralph and Millie’s grandson, Scot Smith, was married to Meredith Phillips (Merry) in July 1994 in California. They live in Cupertino, CA. He is the son of Bonnie Wolfe Modrich. Their granddaughter, Sheri, was married in October 1993 to David Sibik and live in Palm Harbor, FL. Sheri is the daughter of Bonnie Wolfe Modrich. ALFRED WOLFE FAMILY: Charles and his wife Ann. Charles was 90 on September 15, 1994. Betsy Wolfe Dorney and her husband, Don. Betsy is the daughter of Henry Wolfe. 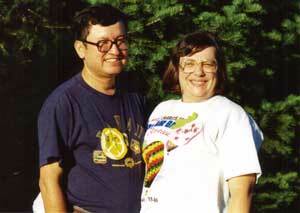 Terry Smith and his wife, Roseanne; Terry is the son of Marion Wolfe Smith. The children’s games were coordinated by Eileen and Ron Angelino. The pictures are proof of a good time by all – baseball, beanbag, and quoits. We now know that the names of the daughters of John and Barbara were Margretha (Peggy) and Mary Magdelene. There were many land disputes between the Connecticut settlers, the Penn settlers, and the Indians with resultant bloody massacres. We assume that is the reason John and Barbara came over the Blue Mountain from Northumberland County to the Lehigh Valley and attended the Zion Church at Schoeners. In 1780, a log building named Zion’s was built by the German Reformed and Lutheran congregations. This was located on the old cemetery ground on what is now Airport Road (ABE airport). Folklore has it that during services at the log church, four people were posted at the outside corners to warn of Indian attacks. From 1780-1791, Reverend Johann Ernst was called as the first Lutheran pastor. The area was called Schoeners. In the church Registers, we found that Andrew was confirmed in 1799 at Zion Lutheran, Schoeners. His sister, Magdelene was confirmed in 1801, and Margretha was confirmed, age 16. John and Barbara were communicants at Zion Lutheran, Schoeners in 1801, 1804. Jacob was born and baptized July 29, 1804. Birth date was June 234 1804. Jacob is our great, great grandfather. Andreas and his wife, Lulsa, took communion May, 1805. We assume Andrew met and married Rebekah Louisa Hasse, a Moravian from the Bethlehem Manor. The Wolf’s came to the valley in 1797 and returned to Luzerne County in 1805. 1795 Sheriff directed to levy a sanction on John Wolf for non-performances of a certain promise (22 pounds, 2 shillings, 4 pence). 1805 John Aurand deed to John Wolf began at a post, then to a stone heap, then to black oak, another hickory, a chestnut oak, another stone heap. 1808 John Bull et al deed to John Wolf began white oak to post, another oak, to a post, to a stump. 1833 Last will and testament of John Wolf, amended 1836, died April 30, 1838. Andrew Wolf died in 1844. 1844 Rebecca Wolf (Andrew’s widow) releases Barbara Wolf (John’s widow) to John Wolf (Andrew’s first born). 1880 Amos Wolf and wife to Aaron Schneider (land in Coplay). 1880 Amos Wolf and wife to James Wolfe, 2nd Street in Coplay. In the absence of the President, Guy Wagner, and the Vice-President, Bill Wolfe, the business meeting was conducted by Gerald Wolfe. Moments of remembrance were held for Henry Wagner, Lew Wolf, and Leonard Wolfe. Those of us old enough, remember the days we spent at the Wagner farm during the summertime plus the square dances after a sale. It’s where I (Virginia Wolfe Smith) learned to square dance. My Uncle Harvey saw to that. Lew had a dedication and a strong commitment to our family heritage. He didn’t want our findings to be in vain, but to keep the story alive for the present and future generations. 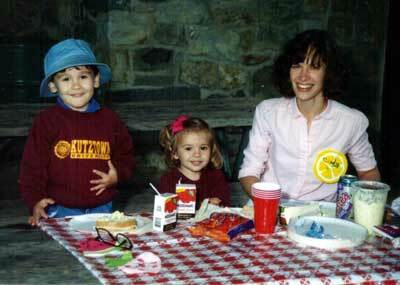 The reunion will be held on August 25, 1995 at the Louise Moore Colunty Park, Pavilion #2. Eileen Wolfe Angelino will make the reservcation. Food – same as this year.